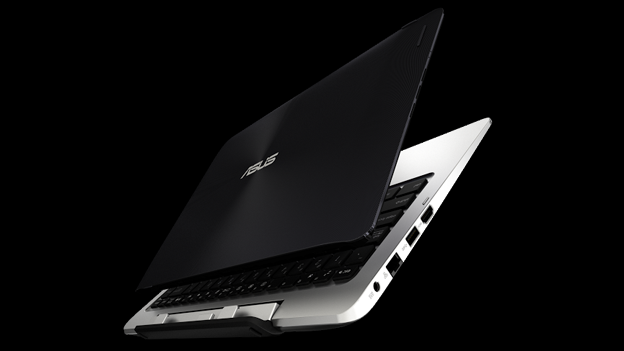 Asus has shown off it has called “the world's first quad-mode, dual-OS laptop”, along with a range of budget Android smartphones. Its Transformer Book Duet TD300 is a 13-inch detachable hybrid laptop that runs both Windows 8.1 and Android 4.1. It's not the first Windows/Android hybrid that has been pitched. However, one of the most interesting features is the ability to switch between Windows and Android with the press of a single button. The device comes with a 13.3-inch IPS touchscreen and runs on an Intel Core i7 chip. According to Asus, it's this chip that allows the machine to quickly switch between the two operating system. The company has also claimed the presence of an Intel chip means it is twice as quick as ARM-based tablets. The laptop also comes with 4GB of DDR3 RAM and a choice of either SSD storage up to 128GB or up to 1TB with a traditional hard drive. It also comes with 802.11ac Wi-Fi, Bluetooth 4.0, and a front-facing HD webcam. Asus has also taken the wraps off a range of multicoloured smartphones called ZenFone. The smartphones come in a range of sizes from four-inches up to six-inches. All of them come with large IPS screens and big batteries. The Asus ZenFone 6 is the flagship smartphone in the range. It comes with a six-inch 1280 by 720 IPS display. Like the TD300, it is powered by an Intel-based processor, rather than an ARM-based processors that are found in most Android smartphones. In the case of the ZenFone 6, it is a 2GHz Intel Atom Z2580 processor. It also comes with 1GB RAM, a 3230mAh battery, 13-megapixel rear and 2-megapixel cameras. The ZenFone 5 comes with the same resolution screen, but on a five inch screen. Its battery also drops by quite a bit to a 2050mAh, and it comes with an 8-megapixel rear camera. The ZenFone 4 is the budget option in the range. It comes with a four-inch 800 by 480 pixel display, a 1.2GHz Intel Atom Z2520 processor and 1GB of RAM. The battery is 1170mAh, while it comes with a 5 megapixel rear camera. Asus said that launch and pricing details for all of the devices will be announced soon. Comes at a price though. £4,000 to be exact.